Does your ballet class hairstyle stand up to the force of chaines and multiple pirouettes? Nothing screams “amateur” like hair and hairpins flying. Oh, the embarrassment of the undone bun! But with just a little effort, you can put those pedestrian days behind you. I expect students to start doing their own hair for class by around age ten. It can take some time to learn how to master the technique on yourself, but not half as long as you might think – usually a few hours of practice is all it takes. 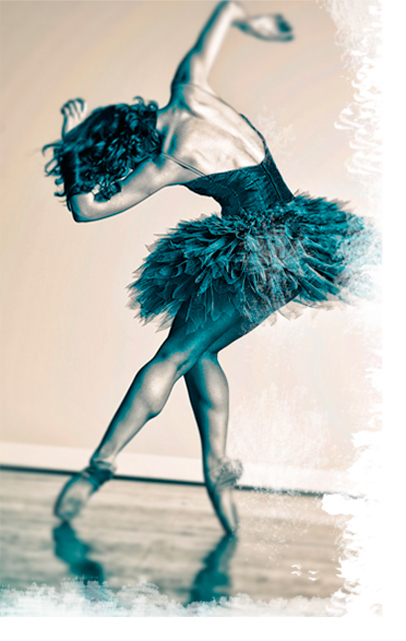 Today, you’ll get the 411 from the CBT on how to master this essential skill for dancers. The basic bun style begins with a ponytail at the crown of the head. This step has to be done correctly in order for the bun to take shape properly. Use a good brush to sweep the hair evenly and smoothly into the pony. Dampening the hair can make it more manageable. Secure it with an elastic that is not too bulky, which will get in the way of hairpins and cause bumps, nor too flimsy, in which case it will need too many wrap-arounds and may break easily. Try to find elastics that are close in color to your hair. Use a light spray of hairspray (Elnett is a favorite of celebrity stylists and is available in a travel size.) to sleeken your wispies, or wait until the bun is complete and use clips to take care of them. Once the pony is in place, brush the hair in the tail to re-smooth it. DO NOT to coil the hair into a bun and then try to wrap a scrunchie or elastic around the bun … Seriously, just don’t! The next part is the where it all usually goes wrong – here’s where you twist the ponytail and start to coil it around its base. What makes or breaks this part is whether the bun is kept close to the head with one hand each time the tail is coiled. If you don’t use a hand to secure the bun against the head as its coiled, you’ll end up with a cone-shaped thing that sticks out and looks, well, absurd. After one full coil is made around the ponytail base, start inserting hairpins horizontally from the outer edge of the coil into the base, every inch or so of the circumference. Make sure to grab a bit of bun hair with each pin and a bit of hair from the scalp beneath the bun. That’s what connects the bun to your head. If you don’t feel a bit of resistance, the hairpin is probably just sitting in the bun and is not connecting anything to anything. As with the elastics, try to find pins that are similar in color to your hair. I find that U-shaped pins work better than “bobby” pins. When you reach end, tuck the tail in and secure with a hairpin. Remember to secure wispies with clips; clip your bangs too if your studio requires. Voilá, a respectable bun! Many dancers opt to also wrap a super-fine hairnet, again matched to the hair, around the bun to lock in bun wispies. Hair spray may be all that is needed for some, though others find these steps to be overkill. Whether you choose to do these steps may depend on the culture of your studio and your personal preferences, but both are must-dos for performances and auditions. The ballerina bun isn’t just one style, it has many variations depending on the height wear the bun is fixed and what is done with the surrounding hair. A bun that sits very high on the head is generally associated with Balanchine technique, and a bun that sits low is often associated with more old-school techniques and, if the surrounding hair covers the ears a bit, with romantic-era ballets. Once you’ve mastered the basic technique, play around with different configurations to find the style that suits you best. It’s a commonly held belief that the high bun is preferred for auditions, but the truth is that what’s best for auditions is dependant on what style the company or school is and what you feel most comfortable in. For class, its fun to experiment by adding a braid to your hairline, inverting the pony, braiding the pony or accessorizing with ribbons or flowers. There are tons of options out there – go have fun with your bun!